When I first decided to be a stay-at-home mom, I had all those lovely images in my head of how the days would go. My baby boy would nap peacefully in his crib while I worked around the house, completing tasks and making delicious meals for our family. Soon after our son was born, I found a very different picture emerging. I was exhausted. My adorable son whom I loved so dearly would not sleep for more than 10 minutes at a time in his crib. He cried A LOT. He would commonly nurse for 2-hour stretches both day and night. I barely had time to eat a sandwich, not to mention make a full hot meal. Most importantly, I noticed that he was very “jumpy.” I had seen other babies nap peacefully in loud restaurants or crowded rooms, but not my son. He awakened easily, he jumped every time the air conditioner clicked on (which was a lot in Texas). The only way he would sleep for more than 10 minutes was to bounce on an exercise ball while he was strapped to my chest in a baby carrier. I thought for sure I was doing something wrong or there was something wrong with him. I Googled everything I could, I read parenting books. Nothing really answered my questions completely except…time and observation. What I soon figured out was that I was raising a highly sensitive boy. Through my training in child development, I had learned about temperament. Over time, I started to learn that this sensitive nature was part of his temperament. As he grew, I began to understand more how this sensitive boy interacted with the world. He was extremely observant, certain noises or textures bothered him, and he became overstimulated easily. As time went on, we learned he was an extremely picky eater and was sensitive to changes in routine (like a missed nap or late bedtime). If you can relate to this description of my son, then you might be raising a sensitive boy as well. Luckily, we now have more research available on highly sensitive children, their needs and how we can guide them. It’s good to point out here that highly sensitive children do not generally have a processing disorder or any other issue that could be considered a “diagnosis” (although you can always speak to your physician about concerns). High sensitivity, as described above, is just a temperamental tendency. Some kids might show more of one of these qualities than others but these are the general types of tendencies that researchers have seen. All temperamental tendencies come with their own challenges and opportunities and a highly sensitive temperament is no different. However, highly sensitive boys, in particular, may experience challenges due to our cultural understanding of gender roles. Traditional gender roles would have us believe that men (and boys) don’t experience emotions like sadness or empathy. Society tells boys to be strong and powerful which is often code for “angry” or “aggressive.” Boys who cry easily, who are attuned to others’ emotions, or overstimulated easily are unfortunately often misunderstood in our culture. Many observers (or family members) of sensitive boys will often chide their parent to “toughen him up.” After understanding the research on highly sensitive children, I think it’s clear to see why “toughening him up” is neither a prudent or possible choice. Temperamental tendencies, like sensitivity, are generally thought to be wired into one’s personality from birth. Just as you cannot force an introvert to be more extroverted by pushing them into a room full of strangers, it’s unlikely parents will be able to “toughen up” a sensitive boy by expecting him to stuff down his emotions. Secondly, trying to “toughen up” a sensitive boy will only rob him of the positive qualities that this temperament brings. 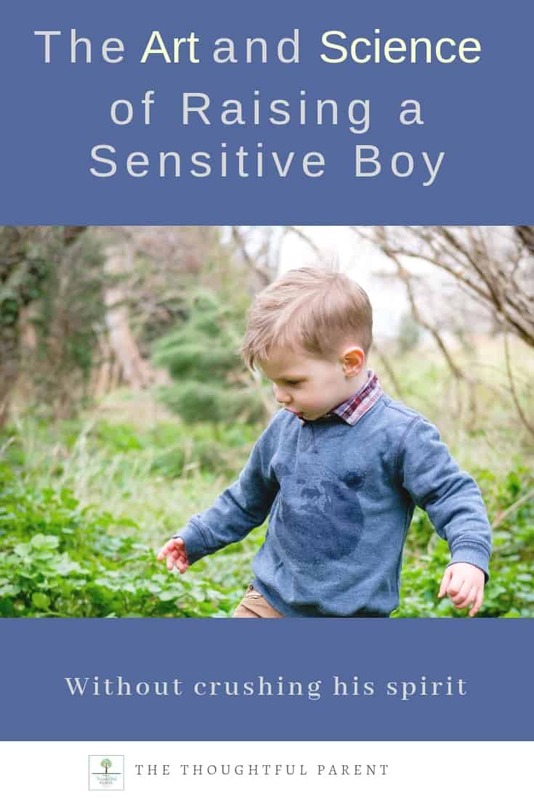 Highly sensitive boys see the world at a deeper level, they notice things others miss, they are often very creative and perhaps most importantly, they tend to be very empathetic. In a world dominated by conflict and strife, we need more boys growing up into men who know how to step into another person’s shoes and really understand their perspective. Sensitive boys have BIG emotions. When he is mad, he’s really mad. When he’s sad, he’s really sad. These emotions can often be difficult for parents to accept. As parents, we don’t like to see our kids suffer. We want to find a quick way to make these big emotions stop. However, it’s crucial to remember that our job is to guide him through the emotions, not necessarily to get stuck in those emotions with him. Ultimately we cannot control our kids’ emotions through punishment or consequences. We can provide a context of meaning for the emotions, we can listen, we can offer guidance, but we cannot magically make the emotions disappear. Encouraging sensitive kids to stifle their emotional reactions will usually only backfire. Sensitive boys tend to get overstimulated easily, but being young, they often do not recognize this about themselves. My son is a perfect example of this. He is sensitive but he’s also very social. He comes alive when he plays with friends, he’s super active and loves sports. This can be an interesting combination of traits, in that he will run himself until he’s totally empty—both physically and emotionally. It’s taken us a while to learn this about him. We often wondered why he was so prone to meltdowns after school or after a busy day. This combination of a need for social interaction but a tendency to get overstimulated is really the cause. Over the past few months, we’ve been working with him on learning to set boundaries for himself so he doesn’t get to the point of meltdown so often. Helping sensitive boys learn boundaries is a crucial skill. 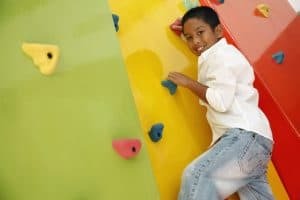 While my son is fairly extroverted and needs social interaction, other sensitive boys might be more introverted and need more quiet time to function well. Similarly, some sensitive boys might use their empathetic skills so well that they are constantly giving to others, both emotionally and physically. In all these situations, these sensitive souls need to learn how to set boundaries for themselves so they don’t become overwhelmed or exhausted. When they are young, we parents often have to step in and set these boundaries for our kids. As they mature, however, you can work with them to help them understand why they need to take time for quiet, for rest and for emotional recovery. Guiding sensitive boys to understand their own temperament can be both helpful and empowering. Helping sensitive boys see the strength in their temperament is also very empowering. Sensitive boys can easily become the victim of bullies if their emotional nature is seen as weakness. It’s crucial for us to help boys understand how sensitivity and empathy are a source of strength. One way we can do this is by turning his sensitivity traits on their head. For example, his sensitivity to textures and sounds might make some settings challenging (e.g., loud play areas, loud movies), however, they may also make him excellent in creative endeavors like movie-making, painting or music. Similarly, his attention to detail can sometimes lead to perfectionism, but if channeled in a positive way, it could mean he would be a skilled craftsman, athlete or writer. Remember that sensitive baby who cried all the time? He’s now a super-active 9-year-old who loves baseball. He still has his sensitive-kid challenges, but he’s learning to cope better. 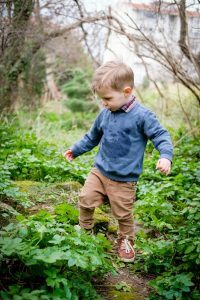 His sensitive nature makes him a wonderful playmate to his toddler cousin (and usually his little brother), a good friend and an acute observer of the world. Guess what? The other day he voluntarily took a break from playing after saying to his friend, “I’ve had a rough day, I need some down time.” Learning boundary-setting is working! 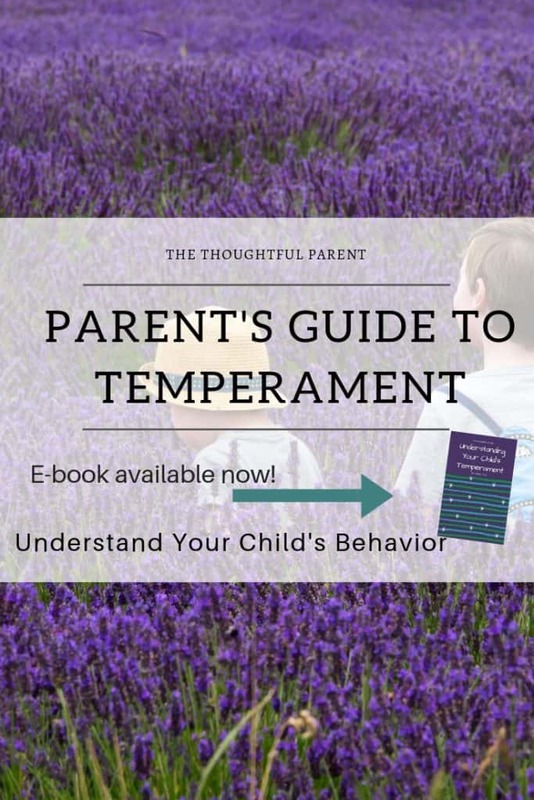 All children have certain temperamental tendencies that make them unique. 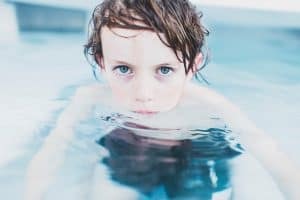 The uniqueness of sensitive boys is often more evident in our culture where gender stereotypes often devalue these characteristics in boys. As parents raising sensitive boys, let’s make it our goal to nurture our boys into men that don’t have to put aside their sensitivity. Instead, these boys will show the world how sensitivity is a true source of strength. This is so timely considering what is rising up in our culture right now, and the damage done to all of us by the patriarchy. Beautiful leading by example.